Stormwater infrastructure has been installed in the park to reduce runoff from entering the Schuylkill River. The Roxborough Pocket Park is currently under construction with an anticipated completion and grand opening set for Spring 2018. Despite freezing temperatures contributing to construction delays, the Roxborough Pocket Park is on pace to open to the public this spring. 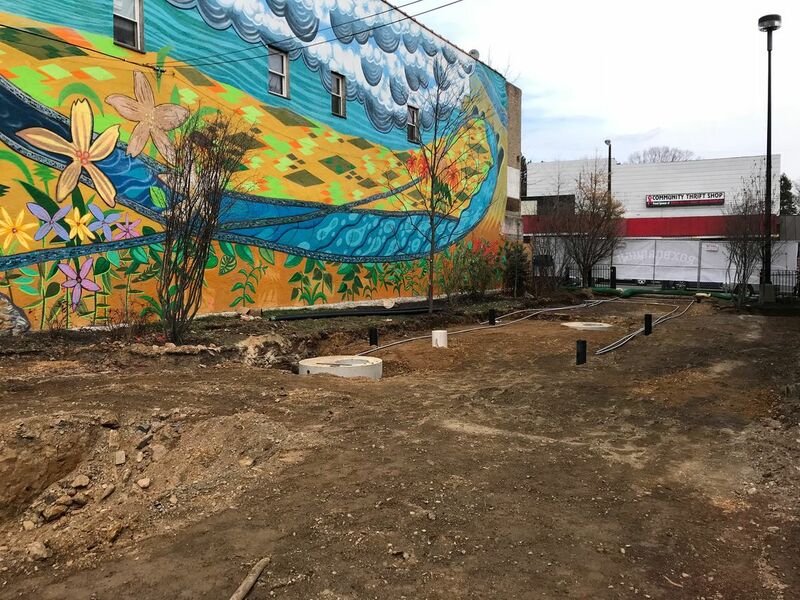 Located at 6170 Ridge Avenue, a once vacant, asphalt lot in the heart of the Ridge Avenue Commercial Corridor will soon be transformed into an inviting, sustainable public space for the whole community to enjoy. Once complete, the 5,500 sq. ft. space will be able to host a number of programs for both children and adults alike, such as farmers’ markets, live music, yoga classes and food trucks. The Roxborough Development Corporation (RDC), owner of the project, has entrusted local Roxborough business Studio Torres Construction Management to oversee construction of the park. Site engineering and architectural services for the project were developed by Ruggerio Plante Land Design, a local woman-owned consultant firm based in neighboring Manayunk. Construction of the park includes demolition, excavating, grading, and the installation of an underground stormwater management system. Following the site preparation work, permeable pavers, perennials, shrubs, deciduous trees, and lighting will be installed. Updating the site with a green stormwater system will include the removal of an abandoned 3,000 gallon fuel oil tank, which will then be replaced with a rain garden. 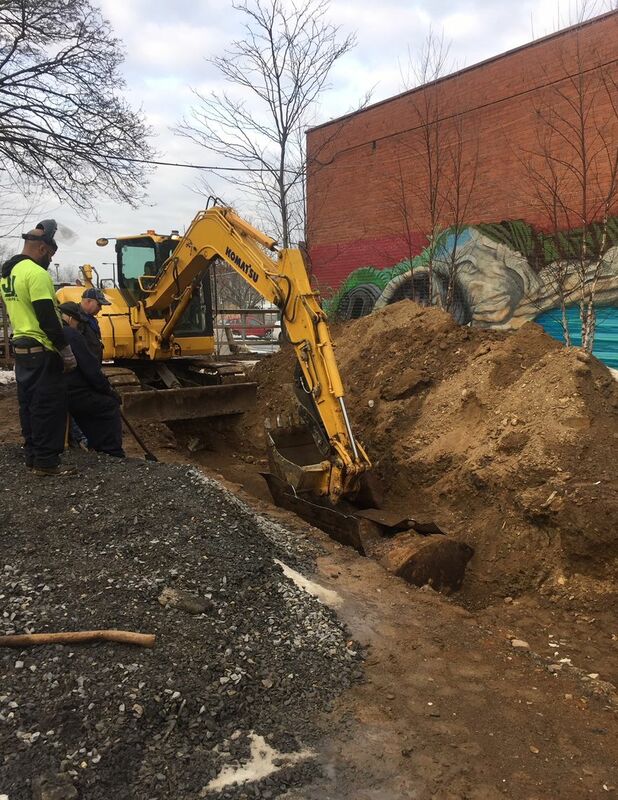 This rain garden will be featured in the middle of the park and will allow rain water to naturally return to the earth and reduce the amount of stormwater runoff headed to the nearby Schuylkill River. The RDC was able to make the Pocket Park become a reality through grant programs and partnerships with numerous state and local organizations. Funding awarded to the project thus far includes the PA Department of Community and Economic Development’s Greenways, Trails and Recreation Program award for $200,000, the Schuylkill River Restoration Fund award for $50,000, an award from the Pennsylvania Horticultural Society for $37,500, the Philadelphia Water Department’s Stormwater Management Incentives Program award for $20,000 and an award from the PECO Green Region Open Space program for $5,000. In addition to funding, the RDC gained crucial support for the Roxborough Pocket Park from city and state officials including Senator Vincent Hughes, Representative Pam DeLissio and Councilman Curtis Jones, Jr. The Roxborough Pocket Park evolved from the creation of the Roxborough 2020 strategic plan. This initiative engaged over 700 residents and stakeholders on rethinking the direction of Ridge Avenue and the Roxborough neighborhood. Following Roxborough 2020, the Roxborough Development Corporation selected Groundswell Design Group to build off of this interest and lead a visioning process which resulted in the current concept and design of the Roxborough Pocket Park. Crews work to remove abandoned 3,000 gallon fuel oil tank.